Botanical Name : Nigella sativa L.
It has been traditionally used for a variety of conditions and treatments related to respiratory health, stomach and intestinal health, kidney and liver function, circulatory and immune system support, as analgesic, antiinflammatory, antiallergic, antioxidants, anticancer, antiviral and for general well-being. Treats ailments including asthma, bronchitis, rheumatism and related inflammatory diseases, to increase milk production in nursing mothers, to promote digestion and to fight parasitic infections. Its oil has been used to treat skin conditions such as eczema and boils and to treat cold symptoms. Seed that stimulates the body's energy and helps recovery from fatigue and dispiritedness. Black Cumin(Kalonji) removes the obstruction of any part of the body, expels the gases and strengthens the stomach. It is Emmenagogue, Lactogogue and Diuretic. It is an Anti-Helminthic, if taken with vinegar. It is useful in chronic cold. Inhalation of its smell is useful in common cold. Continuous use of kalonji is effective in mad dog biting. Fumigation of kalonji is useful in respiratory diseases. It is useful in paralysis, Facial Palsy, Migraine, Amnesia and Palpitation. It is also an expectorant and antipyretic. It normalises the secretions of stomach and pancreas. This phenomenon is very much effective and significant in the treatment of Diabetes Mellitus. It expels the kidney and urinary bladder stones, if taken with the syrup of honey. It is effective in jaundice also if taken with milk. It’s powder if taken with water is effective in Haemorrhoids. If Kalonji seeds are boiled in vinegar and this solution is applied on Gums and Teeth, it removes the inflammation of the gums and relieves the pain also. 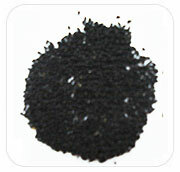 Kalonji is also used in skin disorders. The oil of the seeds is also effective in earache. Nigella Sativa is traditionally known in Middle Eastern countries as "Habbat al Barakah" - 'The Blessed Seed', due to it's powerful healing qualities for many ailments. 70% of patients with allergic conditions, among them being pollen and dust allergies, asthma and neuro-dermitis were cured by Nigella Sativa. It stimulate immune cells and raised the interferon production which protect cells from the cell destroying effect of viruses. It is anti-bacterial and anti-micotic effects and it has an effect in lowering the blood sugar level which is essential for the treatment of diabetes.